During 2019, Freedoms Foundation and the Friends of the Medal of Honor Grove are paying tribute to the living recipients of the Medal of Honor on the anniversary of the actions for which they earned the nation’s highest award for valor. The series continues with a look at Jan. 31 to Feb. 6, 1968, and the actions of Marine Corps Gunnery Sgt. John Canley during the Battle of Hue. “On 31 January, when his company came under a heavy volume of enemy fire near the city of Hue, Gunnery Sergeant Canley rushed across the fire-swept terrain and carried several wounded Marines to safety. Later, with the company commander seriously wounded, Gunnery Sergeant Canley assumed command and immediately reorganized his scattered Marines, moving from one group to another to advise and encourage his men. Although sustaining shrapnel wounds during this period, he nonetheless established a base of fire which subsequently allowed the company to break through the enemy strongpoint. “Retaining command of the company for the following three days, Gunnery Sergeant Canley on 4 February led his men into an enemy-occupied building in Hue. Despite fierce enemy resistance, he succeeded in gaining a position immediately above the enemy strongpoint and dropped a large satchel charge into the position, personally accounting for numerous enemy killed, and forcing the others to vacate the building. 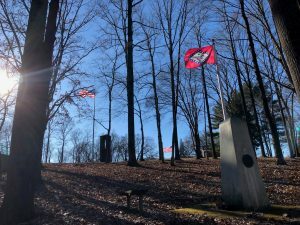 “On 6 February, when his unit sustained numerous casualties while attempting to capture a government building, Gunnery Sergeant Canley lent words of encouragement to his men and exhorted them to greater efforts as they drove the enemy from its fortified emplacement. Although wounded once again during this action, on two occasions he leaped a wall in full view of the enemy, picked up casualties, and carried them to covered positions. Canley was awarded his Medal of Honor by President Donald Trump on Oct. 17, 2018, more than 50 years after the Battle of Hue. In attendance at the White House ceremony were his children, grandchildren, and many of his fellow Marines. 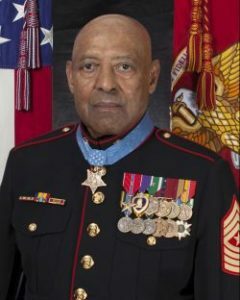 John Canley will be honored in the Arkansas Area of the Medal of Honor Grove. “As they approached a large intersection, the shooting suddenly surged. Men once more dived behind the tanks and trucks and off the road. An enemy machine gun was in a bunker on the right side of the road, which gave it complete command of the intersection. Two platoons were trapped in a gully, unable to move. “One of the men there, the sockless private from South Philly, John Ligato, figured he was dead. Rounds hit the water around him in the ditch and sent up sprays. He flattened himself farther into the mud, his bare feet cold and soaked inside his boots. A primal fear took hold. He thought there was nothing that could train men for this: the noise, the blood, the screams, the shattered bodies, the roaring of guns on all sides. He made himself still and small. Every inner alarm screamed, Flee! But where? Movement meant death. Even if he got lucky at first, raising himself, where would he go? To the east and back was the only conceivable retreat, but that meant standing up exposed in an open rice paddy — no cover for miles. Canley was the 300th Marine to receive the Medal. He retired in 1981 as a sergeant major after 28 years in the Marine Corps.